This is brief knowledge about the Amazing theme on OpenCart , but you can get an idea of how easy it is to set your theme home page layout. No needed to write the code for designing Amazing theme. Everything is performed straight from your dashboard. When you install all modules and set on home page of Amazing theme you get a very good & attractive home page. By help of this article you will learn how to set layout of home page to amazing theme. And you can set your home page layout more attractive. But for the setting your home page you needed purpletree amazing theme modules. We provide modules for our amazing theme. They are very important to install for setting layout as you need. Modules dropdown will show all purpletree Amazing theme modules which are need to install. If we do not install these modules we can’t set the layout for Amazing theme. 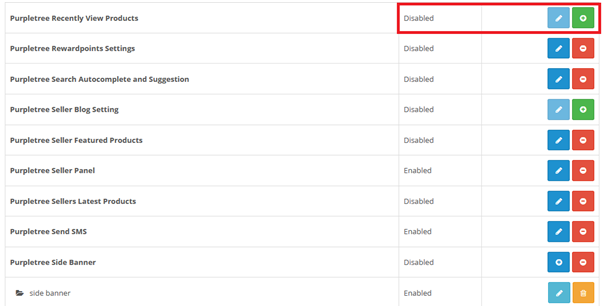 After installation modules status are need to enable because by default all modules status are disabled, for change the status click on edit icon and change disabled to enabled. This procedure is easily done via the admin panel of your Open Cart. Log into your Open Cart admin panel. go to Layouts under Design monitor icon & click on home edit icon as given in below graphic. Here user can set the position of module as needed. Click on plus icon and add module, as below graphic instruction. Contents header top provide the top position of your home page, just below to menu. Mostly this position is use for full width slider. If you set this position for content then you can not set any type of content left side or right side to it. In this section you can set your featured products, banners, related products and so on. Content bottom means content will show in bottom to page. Here you can set carousel ( slider ) for the brands ( manufacturer ).